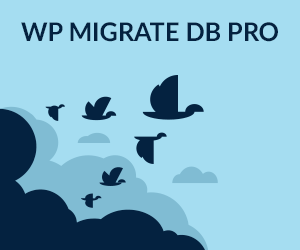 This tutorial sets up the AMP stack in more of a traditional way using the loaded Apache and PHP and downloading MySQL and phpMyAdmin. For macOS Sierra check tutorial here. If you are looking for more of a GUI set up with no command line required be sure to check out the guide on Pressmatic. Their is no GUI to toggle Web Sharing on or off in OSX 10.11, which was previously a GUI option in System Preferences way back in 10.7, but fear not Apache is installed ready to be fired up. For those not familiar with the Terminal, it really isn’t as intimidating as you may think, once launched you are faced with a command prompt waiting for your commands – just type/paste in a command and hit enter, some commands give you no response – it just means the command is done, other commands give you feedback. 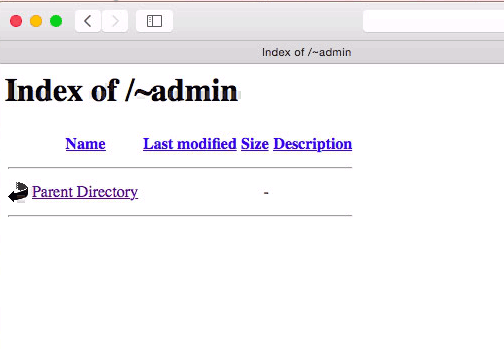 Using the prefix of sudo is required for commands that have their applications protected in certain folders – when using sudo you will need to confirm with your admin password or iCloud password if set up that way…. lets get to it…. And also uncomment this configuration file also in httpd.conf – which allows user home directories. Uncomment in httpd.conf – should be uncommented on a clean install. 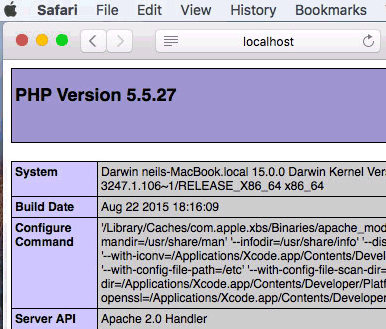 PHP 5.5.29 is loaded in the build of OSX 10.11.1 El Capitan and needs to be turned on by uncommenting a line in the httpd.conf file. 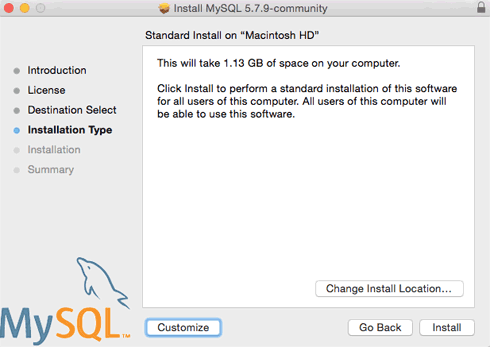 MySQL is again a missing component in OS X 10.11 and needs to be dowloaded from the MySQL site use the Mac OS X 10.10 (x86, 64-bit), DMG Archive version (works on 10.11). The latest version available is MySQL 5.7.9. This version corrects previous issues with starting mysql on boot as Apple changed the launch process on OSX Yosemite onwards. If you are upgrading from a previous OSX and have an older MySQL version you do not have to update it, it will work just with the same start up issue. One thing with MySQL upgrades always take a data dump of your database in case things go south and before you upgrade to El Capitan make sure your MySQL Server is not running. Run the standard install which will also install a System Pref Pane and support for launching MySQL on boot. 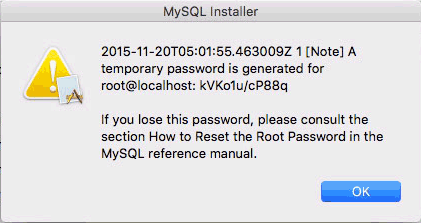 Something new in the latest version of MySQL for OSX that is after the install you are give a temporary password which you need to take a copy of, you can change that later. Relaunch you System Preference and you will see a new MySQL Preference, which you can start/stop MySQL and also enable to have it launch on boot. Enter/paste your MySQL root password when prompted, the temp one you copied earlier, this also puts you in to a shell interactive dialogue with mySQL, type q to exit. You will get the version number again, just type “\q” to exit. To run a website with no permission issues it is best to set the web root and its contents to be writeable by all, since it’s a local development it shouldn’t be a security issue. That’s it! You now have the native AMP stack running ontop of OSX El Capitan.